While Millennials are credited with making the most noise about environmental issues, conservation and green living practices have been important issues for today's active adults of the Baby Boomer generation for all of our lives. Indeed, Baby Boomers (the generation of active adults age 55 and older) ranked highest in a survey measuring the best eco-conscious habits, beating out Gen-Xers and Millennials in areas such as water use, recycling, energy conservation and food consciousness. The study, conducted by High Tide Technologies, determined that Baby Boomers demonstrate the most real care for the environment in terms of having solid earth-friendly habits. And we believe that these habits have stuck with the Baby Boomer generation as it has aged. The common myth that people get more conservative as they age (and therefore less willing to adopt progressive ideas) is being dispelled along many lines with many active adults. Many of us feel the need to realign our lives, to work against looming, irreversible climate change and species extinction. More and more scientific proof of climate change and the problem of solid waste in our landfills and oceans has emerged over the lifetime of the Baby Boomer generation. This deep level of concern spans many generations, and people of all ages are challenging themselves to help change the situation. Actor Jeff Bridges (age 69) narrates “Open Your Eyes,” a video that draws attention to the global emergency of plastic pollution. Recording artist SZA (28 years) plants the seeds of awareness about unsustainable and (environmentally detrimental) fashion industry practices. One of the most dramatic environmental issues we face today is the omnipresence of plastics. Plastics are one of many types of waste that take a long time—up to 1,000 years—to decompose. Unfortunately, many plastic waste materials have found their way into our oceans. Saving the world’s oceans and marine species is a cause that has mobilized people of all ages. While the voices of the Millennial generation are often the loudest in their outcry against environmentally destructive practices, conservation and green living is largely a practice that began with the Baby Boomer generation. More and more active adults are challenging ourselves—and each other—to stop the cycle of plastics in our lives. It’s difficult, but not impossible. One of the most difficult challenges we face as humans today is ridding our lives of dependency on plastics. But heart-wrenching photos and stories of the damage plastic waste is doing to our environment can (and should) turn us down this path. There is, unfortunately, no shortages of photographic evidence of plastic’s death toll on marine birds, mammals and turtles. These creatures ingest or choke on plastic straws and other plastic waste that is non-recyclable and found in ever-increasing amounts in our oceans. 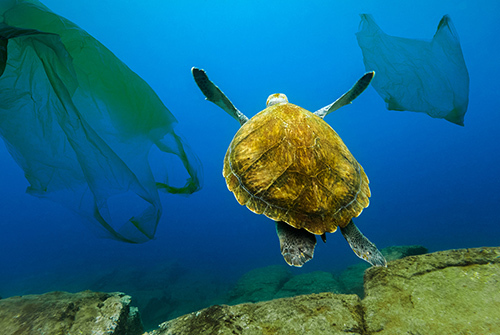 Every year, an estimated eight million metric tons of plastic ends up in our oceans. Working in tandem with Millennials, active adults of the Baby Boomer generation are mobilizing to remove plastics from our lives. As we downsize, Baby Boomers and empty nesters are challenging ourselves—and each other—to live sustainably. It’s difficult, but not impossible. In his February 2019 New York Times article, Author Steven Kurutz outlines the difficulty plastic "purgers" have in completely ridding their lives of all plastics. Try filling a prescription or getting a medical procedure without the use of plastic. But plastic purgers such as Beth Terry, an accountant from Bethesda, Maryland say, “Don’t try to do everything at once. It’s been a practice of mine not to get overwhelmed by it all.” Terry is author of Plastic Free: How I Kicked the Plastic Habit and How You Can Too. The conundrum of ridding yourself of plastic invites more complex questions: How do I affordably feed my family with foods packaged in non-plastic materials? Doesn’t the energy used in shipping of heavier materials such as aluminum or glass outweigh the advantages of a plastic-free existence? The answers are complex, but boil down to building good habits, and learning to come equipped with the tools you need to reject plastic use at every turn. Bring canvas or woven baskets to the farmer’s market and grocery store, keeping glass or aluminum jars and storage containers on hand to hold bulk items. Carry a metal or bamboo plate and utensil set with you wherever you go. And avoid fast food. All fast food restaurants have plastic in their packaging. In late February 2018, the world’s first plastic-free supermarket aisle opened to the public within an Amsterdam branch of the Dutch supermarket chain Ekoplaza. Over 700 products on the store’s shelves are clearly marked with the word “Free” to help shoppers differentiate the products that are completely free of plastic packaging from those that are not. The designs, created by London firm Made Thought, are clear and simple enough to be replicated in supermarkets around the world. The goings-on at Ekoplaza give us hope for the future. But since we all don’t live in Amsterdam, here are some ideas to get you started in your quest for freedom from plastics. It’s all about reducing single-use plastics by changing a few daily habits. From the New York Times article, it will help you begin the daunting journey towards that illusory plastic-free horizon. 1. Carry a reusable bag. This is Plastic-Free-Living 101. Take a cloth bag to the grocery store, farmers’ market, drugstore and anywhere else you may be given a plastic bag. Glass or metal jars can be used to store grains, nuts, flour and other foods, as well as laundry detergent, dish soap and body creams. But don’t automatically purge all of your plastic containers; that creates unnecessary waste. Plastic purgers can never have enough stainless-steel bottles. 3. Pack a travel kit. 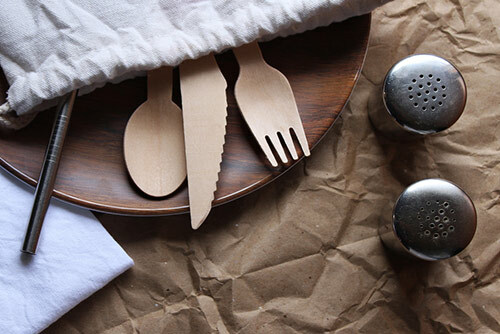 Bamboo cutlery and a non-plastic food tray, straw and water bottle will eliminate the need for most single-use plastics while on-the-go. “Restaurants and vendors all over the world are getting much more used to people bringing their own containers,” said Jay Sinha, a founder of Life Without Plastic, an online store. To avoid food packaging, shop the bulk aisle at the market and bring your own glass containers. Weigh the jar beforehand to avoid being overcharged. Clear plastic bottles, bottles for shampoos, yogurt containers, toys and reusable food containers have a higher probability of being recycled. Disposable cutlery, cling wrap and coffee cups and lids have very low probability. Synthetic fibers from clothing “are an enormous plastic pollution problem,” said Mr. Sinha, because they are a key contributor to microplastic pollution. Choose clothing made of fabrics like cotton, wool, hemp and silk. If it’s plastic or nothing, you can always choose nothing. Treplus Communities are luxury senior apartments that fit today’s active adult lifestyle. Our exclusive ranch homes have no steps, and amenities like attached garages, gourmet kitchens with gas stoves and loads of storage make you think you’re living in a condo for rent. Treplus Communities luxury rental homes offer active older adults the freedom and flexibility to relax, entertain, explore the surrounding community, or take time to travel. Concierge services are available through our professional management team, and all maintenance issues are taken care of by our attentive staff. Our luxury senior apartment communities Hawthorn Commons in Dublin and Redbud Commons in Pickerington are now leasing. A third senior apartment community, Burr Oak Commons, is under construction but opening soon in Delaware, Ohio. See why Treplus Communities is the premiere 55+ rental living provider in Central Ohio. You’ll understand that Treplus is truly redefining 55+ living!